PT Aneka Tambang Tbk - ANTAM (IDX : ANTM) is a leading public-listed company in Indonesia, running business in the field of integrated mining and natural resources industry. Based in Jakarta, ANTAM has main mining commodities in gold, silver, nickel, coal, alumina, and precious metals processing. 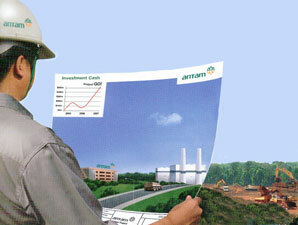 ANTAM engaged in industry, trade, transportation, and other services related with the mining sector. ANTAM is a strategic subsidiary company of PT Indonesia Asahan Alumunium (Persero) or INALUM Group, the largest state-owned mining holding company in Indonesia. At present, INALUM Group is the controlling shareholder of ANTAM with 65% shares ownership. Other 35% remaining shares in ANTAM was owned by public and investors. As of December 2018, ANTAM now has 9 directly-owned subsidiaries, 12 indirect subsidiary companies, and 5 associates and joint venture companies. ANTAM's head office is registered at ANTAM Building - Jl Letjen TB Simatupang No 1 Lingkar Selatan, Tanjung Barat Jakarta 1253. JobsCDC.com now available on android device. Download now on Google Play here. Please be aware of recruitment fraud. The entire stage of this selection process is free of charge. PT Aneka Tambang Tbk - Officer, Senior Officer, SPV ANTAM December 2018 will never ask for fees or upfront payments for any purposes during the recruitment process such as transportation and accommodation.